← What is Metabolic Syndrome? Catabolic hormones, such as glucagon, cortisol and catecholamines, are secreted by the pancreas and the adrenal glands. These hormones increase blood glucose. One anabolic hormone, insulin, secreted by the pancreas decreases blood glucose. Hyperglycemia or high blood sugar. When blood sugar levels are too high, the body suppresses appetite for a short period. Long term hyperglycemia contributes to long term health problems such as heart disease and eye, kidney and nerve damage. The most common cause of hyperglycemia is diabetes. Hypoglycemia or low blood sugar. When blood sugar levels drop too low, a potentially fatal condition can quickly develop. Symptoms can range from a general feeling of discomfort to more serious symptoms of seizures or loss of consciousness. Hypoglycemia most often occurs as a complication of diabetes. Diabetes mellitus is characterized by persistent hyperglycemia and is the foremost disease related to failure of blood sugar regulation. The glycemic response varies between individuals and can vary in the same person from day to day. The glycemic index (GI) measures how quickly blood glucose levels rise after eating specific types of food, the effects of which can vary greatly. Surprisingly, most of us do not consume too many carbohydrates, although we may often consume the wrong carbs. Simple sugar laden carbohydrates, such as candy and soda, are quickly digested, tend to have a high GI, and release glucose rapidly into the bloodstream. Complex carbohydrates such as whole grains, fruits and vegetables, which tend to have a low GI, are digested slowly and release glucose gradually into the bloodstream. Glucose has a glycemic index of 100. Foods are scored on a scale of 0 – 100. 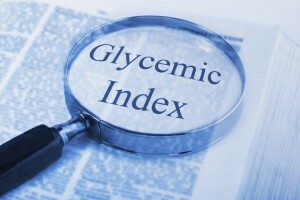 A lower glycemic index generally equates with reduced insulin demand. Low GI – 55 or less includes foods such as beans, nuts and small seeds, whole grains, most vegetables, most sweet fruits like peaches, apples and strawberries and fructose. These foods provide sustained energy as they slowly digest and raise blood sugar levels in a more gradual and regulated way. Medium GI – 56 – 69 includes enriched wheat, raisins, ice cream, bananas, pita bread, basmati rice, unpeeled, boiled potatoes, spaghetti, grapes and sucrose. High GI – 70 and above includes white bread, white rice, corn flakes, pretzels, bagels, baked potatoes, glucose and maltose. These quickly digested foods can cause the blood glucose levels to spike, which when followed by a rapid decline, creates wide fluctuations. Slower digestion keeps you satisfied longer and helps avoid overeating and snacking. Lower insulin levels make fats easier to burn so they are less likely to be stored. Reduces your risk of developing type 2 diabetes and cardiovascular disease. Helps to mange blood glucose levels and complications of diabetes. Reduces triglycerides and LDL cholesterol. Sustains energy levels for longer time periods. Reduces your risk of developing certain eye diseases. Swap high GI foods for low GI foods within the same food group. For example, choose oatmeal (55) instead of cornflakes (93). Choose whole grain bread (51) as opposed to white bread (71). Choose brown rice (50) over white rice (89). Consume at least one serving of low GI carbs at each meal and choose low GI carb snack foods. Choose fresh fruit, nuts or yogurt and limit high GI cookies and crackers to an occasional treat. Fill half your dinner plate with salad and vegetables varied in color. Include beans, lentils and chickpeas several times each week. Combine low and high GI foods for a moderate overall level. For example, rice with beans, hummus with pita bread or chili on a baked potato. Incorporate a lean protein at every meal. Be aware of portion size. Even healthy carbs will pile on pounds if too many are consumed. Exercise 30 minutes each day and move about regularly at other times. The number of grams of carbohydrates will also impact glucose levels. A combination of lowered daily calorie intake, weight reduction, carbohydrate counting and a higher inclusion of lower GI carbohydrates, would likely produce the most stable blood sugar levels. Scientific studies have shown that individuals who followed a low GI diet for an extended period of time had a significantly lower risk of developing type 2 diabetes, coronary heart disease and age related macular degeneration. Weight loss, and maintaining that loss through a healthy, sensible, nutritious diet, combined with regular exercise, appears to be the key to improving your blood sugar levels and your overall health. GlycemX 360 Medical Food by Metagenics is a science based low glycemic index medical food formulated to provide specialized nutritional support for type 2 diabetes. GlycemX 360 supports insulin sensitivity with therapeutic levels of cinnamon, while promoting healthy glucose metabolism and insulin function with chromium, biotin, and magnesium. Glycemic Foundation by Ortho Molecular provides support for healthy blood sugar levels. Lipoic acid is one of the most beneficial nutrients for those seeking to achieve optimal range blood sugars. Chromium facilitates the uptake of glucose into cells, working naturally with the body’s own insulin. Functioning much like chromium, research has revealed that vanadyl sulfate acts to help cells activate transport proteins for glucose uptake. Glycemic Manager by Integrative Therapeutics provides a unique blend of ingredients to optimize glucose metabolism by supporting a healthy glycemic response. Fast acting myricetin helps to quickly move glucose from the blood to the body’s cells where it can be used to create healthy energy. Chromium picolinate aids in improving the efficiency of insulin. Priority Glycemic Control by Priority One with B vitamins, biotin, chromium picolinate and inositol to support insulin efficiency and glucose metabolism. Chromium Picolinate by Douglas Laboratories is formulated to support blood sugar metabolism. Chromium is an essential trace mineral that increases the effectiveness of insulin action thereby influencing carbohydrate, protein and fat metabolism.